Matt is a member of the European Piano Teachers Association. Matt has been playing piano at hotels, bars, parties, weddings and concerts for more than a decade and has a wealth of experience. He was the resident pianist at the Ramada Hotel Birmingham for five years, and also played regularly at The Ditch and Sofias in Walsall and The Royal Hotel in Sutton Coldfield. Matt is also available to play for schools as an accompanist, tutor or composer, and currently works at Hydesville Tower School in Walsall and Ryders Hayes School in Pelsall. Matt has musically directed shows with The Vesey Players, Aldridge Youth Theatre and Trinity Players. He works as an accompanist for Sutton Coldfield Choirs, and has performed with Four Oaks Cluster Choir and Sutton Coldfield Youth Voices at Lichfield Cathedral, the Adrian Boult Hall in Birmingham, Manchester Bridgewater Hall and Birmingham Symphony Hall. Four Oaks Cluster Choir reached the Category Finals (last 4) of BBC Choir of the Year 2012, came 3rd in the prestigious Langollen International Eisteddfod in July 2013 & 14 and won the Manchester Amateur Choral Competition 2015. Sutton Coldfield Youth Voices also performed at Langollen in July 2014, and in November 2014 won a competition to sing at the LG Arena, Birmingham with Andrea Bocelli. He is also available to teach piano and keyboard. 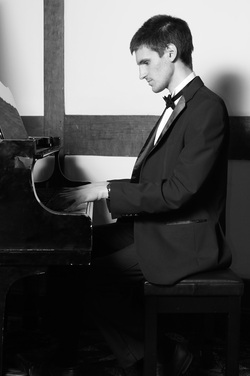 Matt plays at weddings and all other events throughout the West Midlands. He can play a variety of styles to suit your needs and usually charges around £30-50 per hour. If there is no piano at the venue Matt can bring his portable piano keyboard. You can hear Debussy's piano classic Clare de Lune and Yiruma's beautiful River Flows in You in the clips below. If you are on Facebook, listen to other video clips here from his business page, or visit his YouTube channel. Other mp3 files follow.